UC Berkeley students face a shortage of indoor study spaces. Most individuals prefer to study in indoor locations as their needs and preferences regarding safety and comfort are not met in outdoor spaces. 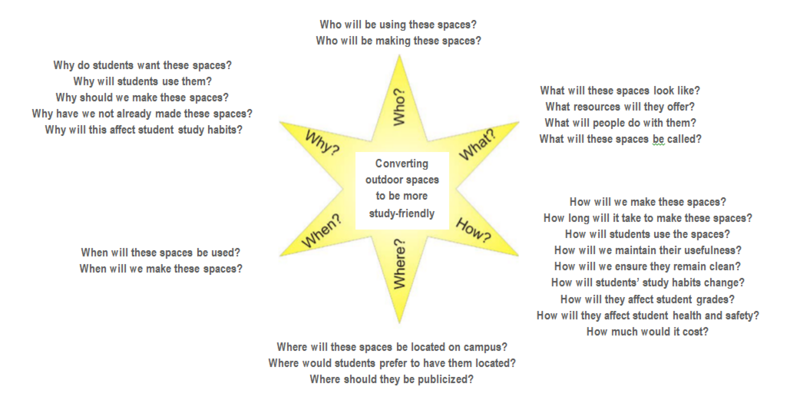 The lack of outlets, benches and chairs, tables and desks, and other utilities hinder students from studying outside and create crowding in indoor spaces. 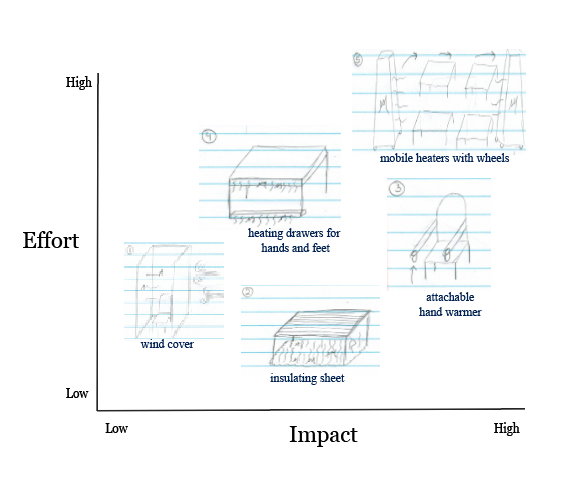 For my project, I will tackle the problem of comfort while studying outdoors. Later in the portfolio, you will find a more detailed thought process on how I came up with a final solution to such a broad problem. 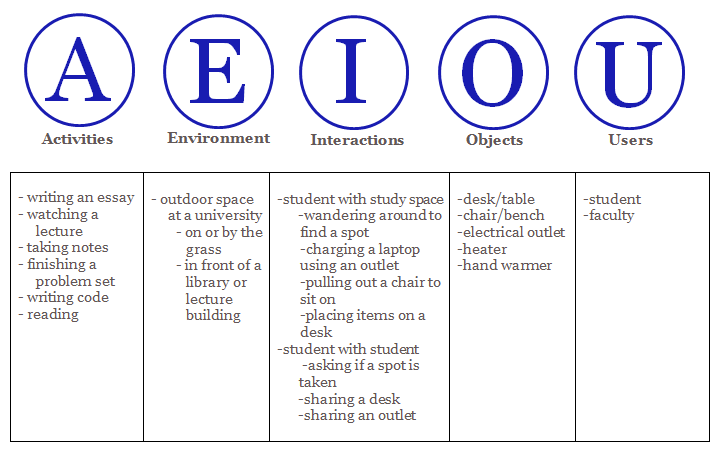 -What are the main aspects you look for in a study space? -Walk me through the last time you went to study on campus. -What time of day do you typically go to study spaces? How long do you stay there? -When is the last time you studied outdoors? How might we make sure students aren't cold? 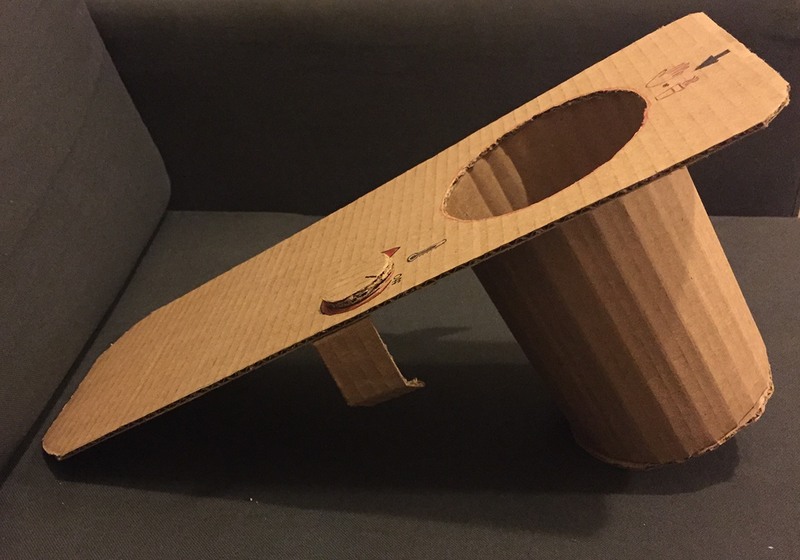 Taking into account interview insights, I created a cardboard prototype of a hand and beverage warmer. The product includes a cup holder with heating technology, a knob to adjust temperature, and clasps to attach to the arm of any chair, may it be wooden, metal, or plastic. Taking into account feedback from my low-fidelity prototype, I created a cleaner design for my product. I rounded the edges, used glue instead of tape, placed the clasps underneath the main base, and added rotating functionality to the knob. Taking into account feedback from my previous prototypes and criticism from usability testing, this is my final product. 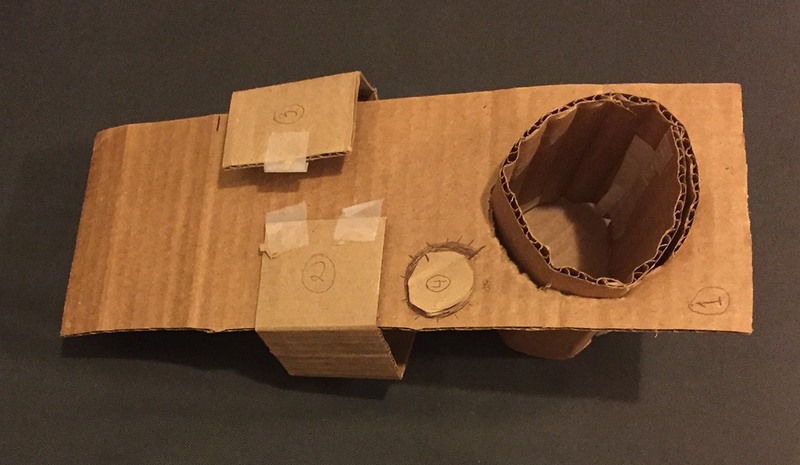 This project forced me to use analytical and problem solving skills to create an innovative solution to a bug many students face on a daily basis. 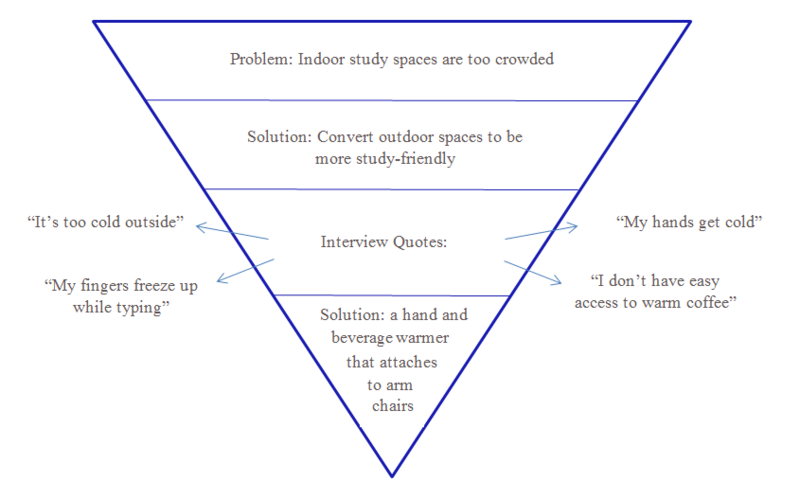 By conducting multiple user interviews and utilizing both divergent and convergent ideation methods, I was able to hone into a specific solution to alleviate the problem of indoor study space crowding. 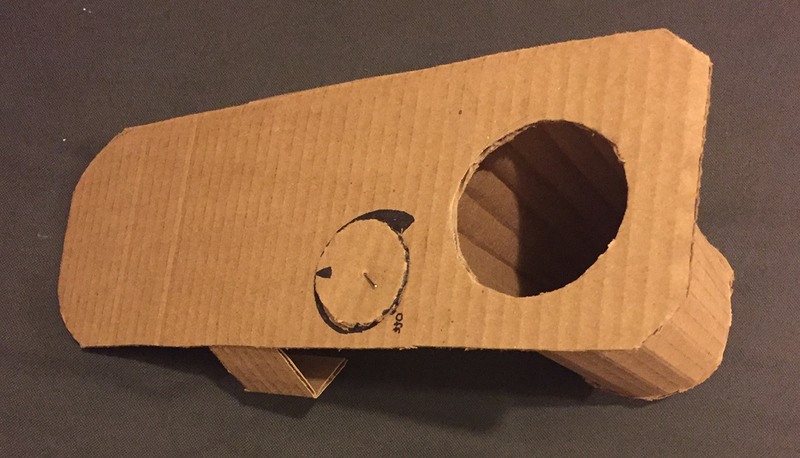 This project allowed me to explore a medium I had previously never worked with--cardboard. 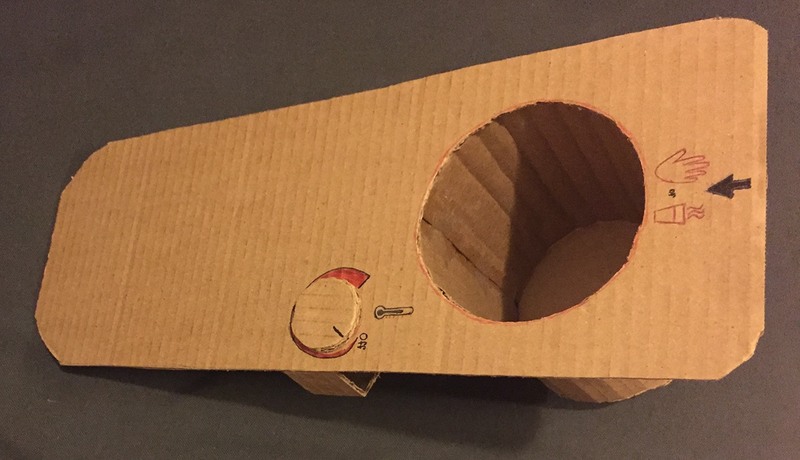 It was a unique experience to learn cardboard prototyping, and I learned how important it is to use an exacto knife for clean cuts, use glue instead of tape, use common household objects for simple shape outlines, and more. I also learned the importance of usability testing. It is a great help to ask potential users about a product because they may provide feedback you never would have thought of by yourself. Overall, this project was a fun and gratifying experience.